Our 2018 fantasy football team power rankings countdown continues today with teams Nos. 8-5, which means we’ve very nearly at the best of the best. The teams on today’s list feature some of the most prominent players in fantasy. As a reminder, these rankings are based solely on how much projected value these teams bring to your fantasy squad on draft day. It is not a reflection of how good or bad they are on the real field. The Falcons may have been bumped in the Wild Card round after their 2016 Super Bowl run, but this team still has plenty of firepower on offense. Atlanta checks in at No. 8 on the 2018 fantasy football team power rankings. The Falcons have the No. 8 backfield from a fantasy perspective. The productive duo of Freeman and Coleman returns to Atlanta’s backfield in 2018. Freeman finished last season as the No. 14 running back (in 14 games), while Coleman completed the year at No. 22 (in 15 games). We once again expect Freeman to be a borderline RB1 while Coleman puts up flex-like numbers with borderline RB2 potential. Last year, Freeman had 196 rushing attempts compared to Coleman’s 156, and Freeman out-targeted Coleman 36-to-27 as well. The split in workload is enough to prevent Freeman from being an elite RB1 (like he was in 2015), but both players see enough work — and are productive enough — to be viable weekly options even in a split backfield. That’s hard to find, and it’s only possible because Freeman and Coleman are both so efficient; Coleman ranked ninth in fantasy points per snap last year, while Freeman ranked 14th. The Falcons have the No. 5 wide receiver corps from a fantasy perspective. Jones is still an elite wide receiver and one of the best wide receivers in fantasy. It’s wild that this has to be said, but based on the way some people treat Jones, you’d think his production was about to fall off a cliff. Common misconception: Julio actually had 16 end zone targets last year, eighth among WRs. He only scored on one of them (6.3% success rate). WR average was 34.8% success rate on EZ targets. Jones is a steal at his current ADP (early second round). 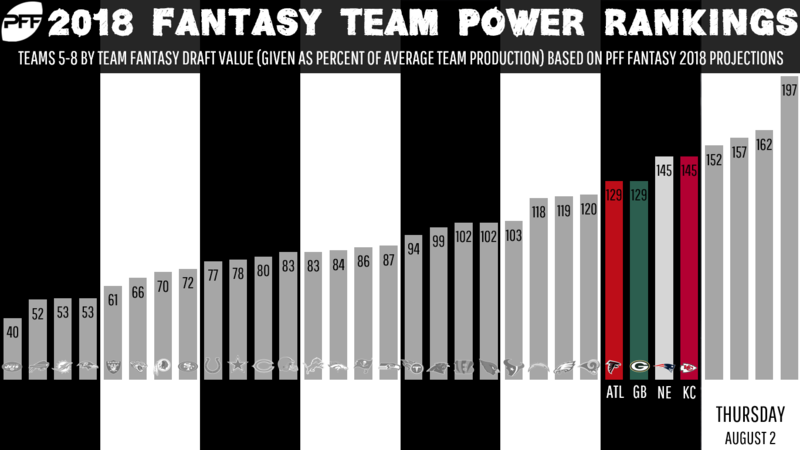 The Falcons did add first-round pick Calvin Ridley to their team, but we aren’t projecting him to make a fantasy splash in year one, given the number of mouths this offense already has to feed. The “other” receiver in Atlanta, Sanu, can once again be counted on to put up bye-week fill-in numbers as he works out of the slot. Sanu is good for a 60-650-4 line, but he doesn’t have a high weekly ceiling. The Falcons have no fantasy-relevant tight ends you need to know for the 2018 draft. The Falcons have the No. 17 group of quarterbacks from a fantasy perspective. Ryan is one of my favorite bounceback quarterback options this season, but while it’s all but guaranteed he’ll throw for more than 20 touchdowns again, he won’t reach the career year he had in 2016, when he threw for 38 touchdowns. Ryan is a viable late-round quarterback target, but odds are he will be best served as a streaming option in 2018. Aaron Rodgers returns to the field, and the Packers added one of the best red-zone threats in the NFL to their team. Things are looking up for this offense in 2018 as the Packers check in at No. 7 on the fantasy football team power rankings. The Packers have the No. 23 backfield from a fantasy perspective. 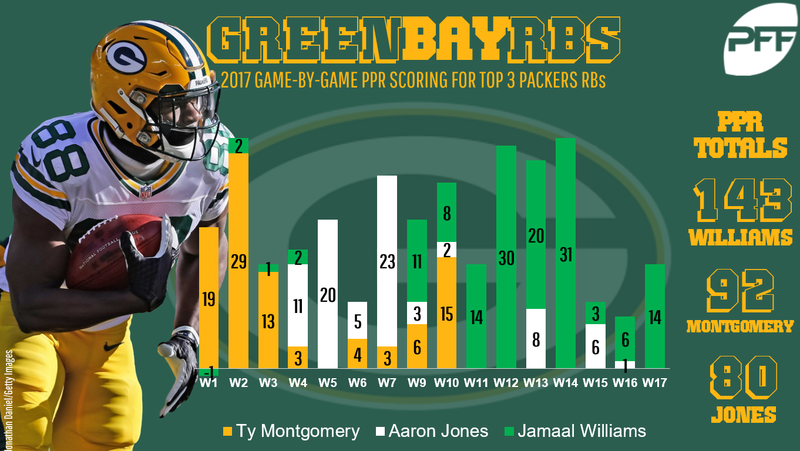 The Packers have a tricky situation at running back, with Williams, Jones, and Montgomery all in the running for snaps and touches. Due to injuries and hot streaks, and a combination of both, the three players split snaps last year, with Williams (441) leading the way. Montgomery (275) and Jones (236) were relatively even. All three running backs have shown that they are capable of putting up big numbers when given the backfield to themselves. The problem is that with all three players healthy in 2018, a committee approach is the most likely scenario. Individually, these players have legitimate RB1 upside in a Rodgers offense. As a group, each player is more of a potential flex option. Right now, we have Williams projected to score the most fantasy points, followed by Montgomery, and then Jones. The Packers have the No. 6 wide receiver corps from a fantasy perspective. Adams and Cobb form one of the best — and, it feels weird to say, but underrated — group of wideouts for fantasy. Adams showed that his 12 touchdowns from 2016 were no fluke, as he followed up that performance with 10 touchdowns in 2017. No player has more receiving touchdowns over the past two seasons. Adams’ ability in the red zone with Rodgers throwing the ball makes him a great fantasy option in and of itself. Throw in the fact he’s now the team’s No. 1 wideout with Jordy Nelson out of town, and Adams is a WR1 option. Cobb has been gaining steam in the fantasy community lately because he is the no-questions-asked No. 2 option in Green Bay now, which is a lucrative post to hold. Cobb is coming off two straight downs year, posting a line of 60-610-4 and 66-653-4 in 2016 and 2017, respectively. It’s fair to think Cobb will do better than that this year, but he’s not going to return to the 91-1,287-12 line from 2014. He’s a flex option with WR2 upside this year. The Packers have the No. 9 group of tight ends from a fantasy perspective. The Packers added Graham this offseason after he led the tight end position in touchdowns (10) while finishing as the No. 4 overall tight end in standard leagues and No. 7 option in PPR leagues. Graham was an elite red-zone threat and he garnered 20 end-zone targets last year, which easily led the tight end position. Graham will again be a mid-pack TE1 this year with the potential to rack up the touchdowns yet again. The Packers have the No. 1 group of quarterbacks from a fantasy perspective. Rodgers is the best quarterback in fantasy when healthy. Since 2011, Rodgers has finished as a top-two fantasy quarterback in four of five healthy seasons. (He was eighth the other season.) Rodgers is our projected top quarterback this year, and that shouldn’t come as a surprise to anyone. New England’s offense has gone through a lot of change — Brandin Cooks and Danny Amendola are no longer in town, Dion Lewis has left the backfield, and Julian Edelman is suspended four games to start the year — but the Patriots still check in at No. 6 on the 2018 fantasy football team power rankings. The Patriots have the No. 15 backfield from a fantasy perspective. The Patriots backfield has long been considered one of the most frustrating from a fantasy perspective. It is true that it’s a frustrating situation — health permitting, we can expect the trio of Michel-Burkhead-White to all share work — but it’s one of the most productive backfields for fantasy. First-round pick Michel will lead the way as a rusher, but his work in the receiving game may be limited given Burkhead and White’s prowess in that area. We can consider Michel a tail-end RB2 with upside if he gets more work in the passing game than projected (or more goal-line work). Burkhead may see a good amount of the goal-line work, which will give him immense upside on a week-to-week basis but may make him inconsistent. Consider him a potential flex option in PPR leagues with upside. White will be the team’s primary third-down back, and it’s a role he has excelled in over the past several seasons. White ranked third in targets in 2016 and ninth in targets in 2017. White will be a viable flex option on a weekly basis in PPR leagues. The Patriots have the No. 22 wide receiver corps from a fantasy perspective. Edelman is suspended to begin the year, but when he returns, there’s no doubt he will reassume his position as Brady’s go-to guy out of the slot. But Edelman is 32, and he hasn’t played meaningful football since the 2016 season. He’ll be a flex option once he returns to the field. Hogan emerged as one of Brady’s best red-zone weapons last year, and with Edelman out to begin the year, he figures to start off hot. Over the first eight weeks of the 2017 season, Hogan was a top-10 wideout in PPR leagues, which gives you a sense of his ceiling. He will be a strong flex option with legitimate WR2 appeal. Matthews is currently projected as just-barely-draftable, but you have to remember these power rankings are based on July projections. With Edelman out the first four weeks, Matthews has the potential to earn snaps in the slot. If that’s the case, he’ll certainly have appeal — at least to begin the year. The Patriots have the No. 1 group of tight ends from a fantasy perspective. Gronkowski is the best tight end in football and the best tight end in fantasy football. He gained 2.4 yards per route run last year, first among all tight ends by 0.4 yards. (That’s huge.) He ranked first in YPRR in 2016 as well, with 3.0. He was tied for first in 2015 (2.3), first in 2014 (2.4), and, well, you get the picture. Gronk is good at football and should be the first tight end taken. The Patriots have the No. 2 group of quarterbacks from a fantasy perspective. Entering his age-41 season, we have Brady projected to finish the year as the No. 2 overall quarterback in fantasy. And why not? He’s coming off an MVP year in which he led the league in yards (4,577) and ranked third in fantasy points. The cliff hasn’t arrived yet, and Brady will be an elite fantasy quarterback again. Now led by second-year quarterback Patrick Mahomes, Kansas City’s offense remains loaded with fantasy talent. The Chiefs check in at No. 5 on the 2018 fantasy football team power rankings. The Chiefs have the No. 10 backfield from a fantasy perspective. Hunt was a revelation last season, and he finished his rookie campaign as the No. 4 overall running back in PPR leagues. He won the rushing title with 1,327 yards and he tacked on a healthy 53 receptions, making him one of only six players to have 200-plus attempts and 50-plus receptions last year. Hunt will push 325-plus touches again in 2018 and remains an RB1. Ware will spell Hunt from time to time, and while that will not make him a viable starter on a weekly basis, it will make him a decent emergency flex fill-in during bye weeks. Ware will vulture a few touchdowns over the course of the season; guessing when will be the tricky part. The Chiefs have the No. 14 wide receiver corps from a fantasy perspective. Hill paced all wideouts with 0.71 fantasy points per opportunity in 2016, and he followed it up in 2017 by posting a 75-1,183-7 line through the air, good enough for the No. 8 overall finish among wideouts. Hill should be viewed as more of a WR2 given his general lack of volume among other top wideouts (all other wideouts that finished in the top 10 in fantasy last year had at least 30 more targets than Hill) but he will outright win you a couple of games on his own. Watkins is an interesting addition to the Chiefs offense because he is also a deep threat. 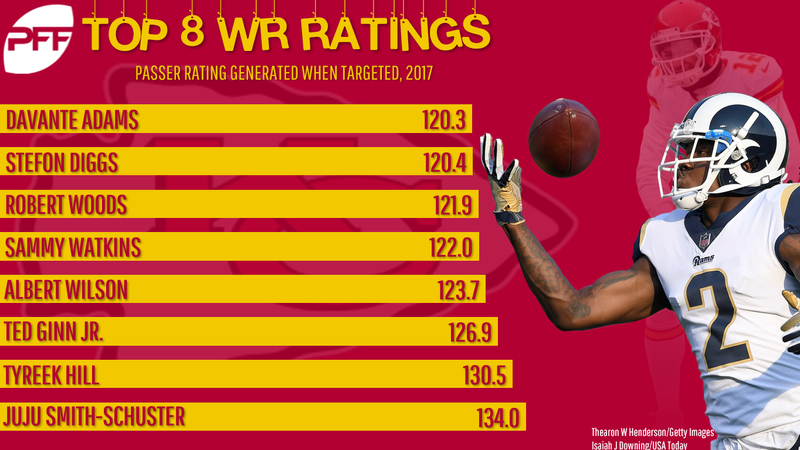 Watkins’ 15.2-yard average depth of target ranked 17th among wideouts last year, and about one quarter (24.2 percent) of Watkins’ targets last year came on deep balls, which was actually higher than Hill’s rate of 23.5 percent. Watkins can be viewed as a flex option, but it remains to be seen exactly how Watkins’ skill set will be put to use alongside Hill. The Chiefs have the No. 2 group of tight ends from a fantasy perspective. If it weren’t for Gronkowski, Kelce would be by far and away the best tight end in fantasy. As it stands, he’s still second-best by a pretty healthy margin. There is one thing Kelce has on Gronkowski: He has done a better job staying healthy over the years, which can make all the difference in the world for fantasy players. Kelce has also ranked either first or second in receptions over the past two season, and we have him projected to finish second in receptions again this year, which gives him a nice floor in PPR leagues. The Chiefs have the No. 15 group of quarterbacks from a fantasy perspective. Mahomes has titillating upside as a passer and a rusher, and that dual-threat ability gives him legitimate top-five upside. For now, it’s safer to think of Mahomes as a streaming option given that we have seen so little of him in the NFL, but he’s certainly a viable late-round pick given the fact he has obvious upside and is surrounded by elite talent.